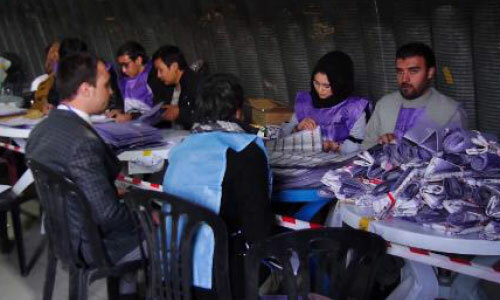 KABUL - The Independent Electoral Complaints Commission (IECC) has expedited the assessment of parliamentary elections-related complaints and will complete it by the end of this week, an official said Saturday. The process will help the Independent Election Commission to announce the final results of the remaining nine provinces, including Kabul. Some complaints are “complicated” and need more time for assessment, member of the IECC Mohammad Qasim Elyasi told TOLOnews. The last October’s parliamentary elections are plagued by alleged corruption and fraud which resulted in removing of all former election commissioner with the hope that the new formation will practice free, transparent and fair presidential elections in Afghanistan which is scheduled for late September. Elyasi said the delay in completion of the assessments has not been due to fewer activities but it has been due to “overload” of work. “We have been working every day with no exception, but the dimension of the issues is very much complicated,” he added. The head of the High Peace Council’s secretariat, Umer Daudzai, at a press conference on Saturday, called on the election commissions to announce the final results of the parliamentary elections in a bid to help the new lawmakers to attend the Grand Consultative Jirga on Peace, which is an assembly of almost 2,500 delegates from around the country who will determine the roadmap towards a dignified and acceptable peace for Afghans. Daudzai, who also heads the organizing committee of the consultative Jirga, said they are waiting for the election commissions to announce the remaining provinces’ results. Member of an election observer organization, meanwhile, claimed that “poor management” is behind the delay in announcement of the final results of the remaining provinces. “Existence of such leaders in the electoral organizations is a big challenge which will result in poor time management,” said Naeem Ayubzada, head of Transparent Election Foundation of Afghanistan. The former members of the election commissions were removed from their posts late in February and their cases were sent to the Attorney General’s Office to probe allegations lodged against them.